Utilities New Service Form / Stop Service Form: Click on the link and fill out form completely. If you are a renter, the property owner's signature is required on the form along with your signature before service can be set up. "If we can't reach you, we can't alert you." You can Sign up to get emergency alerts on a cell phone, work phone, text message, email, home phone and more. Hood River County Citizen Alert System is a tool utilized for mass emergency notifications in Hood River County. Powered by Everbridge, this system utilizes the 9-1-1 landline database for emergency notifications for community alerts, giving Hood River County Emergency Management more options for reaching residents and businesses in the area. There is also a choice to receive alerts regarding locations of interest - emergencies that may affect a residence, workplace, child's school, or other areas as long as those locations are within the boundaries of Hood River County. Public safety officials can send alerts about emergencies such as severe weather, floods, levels of evacuation, utility disruptions or critical police activity. 2019 CITY OF HOOD RIVER ANNUAL WORK PLAN - Projects undertaken by the City of Hood River to meet the community's long-term needs. Public meetings of the Budget Committee of the City of Hood River, Hood River County, State of Oregon, to discuss the budget for the fiscal year July 1, 2019, to June 30, 2020, will be held in the City Hall Council Chambers, 211 Second Street, Hood River, Oregon, on Wednesday April 17, 2019 at 4:30 PM, Wednesday, April 24, 2019 at 6:00 PM, and Wednesday, May 1, 2019, at 6:00 PM. The purpose of these public meetings is for the Budget Committee to receive the budget message and deliberate on the FY 2019-20 Budget. An additional, separate meeting will be held in the City Hall Council Chambers on Wednesday, May 8, 2019, no earlier than 6:00 PM, to take public comment and complete deliberations. Any person may appear at that meeting and discuss the proposed programs with the Budget Committee. 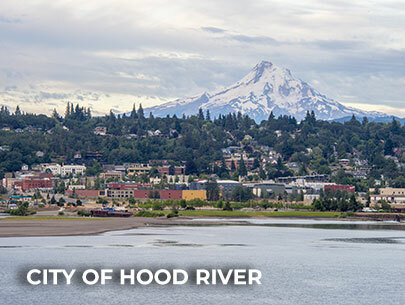 A copy of the budget document will be available on the City of Hood River’s website (ci.hood-river.or.us/FinancialReports) on or before April 17, 2019. A public meeting of the Budget Committee of the Hood River Urban Renewal Agency, Hood River County, State of Oregon, to discuss the budget for the fiscal year July 1, 2019, to June 30, 2020, will be held in the City Hall Council Chambers, 211 Second Street, Hood River, Oregon, on Wednesday, May 8, 2019, at 6:00 PM. The purpose of these public meeting is for the Budget Committee to receive the budget message and deliberate on the FY 2018-19 Budget. Any person may appear at that meeting and discuss the proposed programs with the Budget Committee. A copy of the budget document will be available on the City of Hood River’s website (http://ci.hood-river.or.us/FinancialReports) on or before April 17, 2018. The City of Hood River is now accepting application for Landmarks Review Board. Application forms for Short-Term Rental Licensure and related rules are available HERE. City of Hood River and Urban Renewal Agency Financial Reports are available HERE. City of Hood River park rules are available HERE. Learn about the Westside Area Concept Plan. Property owner's responsibilities for trimming vegetation in public rights-of-way and public safety notification. Street sweeping: public streets will be swept the last Wednesday and Thursday of each month beginning in the southern portion of the city at 7:00 AM and continuing to the north. Please move vehicles from public streets until the sweeper passes. For more information, please call 541-387-5207. Restrictions on distribution of plastic bags - learn more HERE. Recycling with Hood River Garbage - learn more HERE. Pacific Power - Report a street light out in the City of Hood River. Get alerted about emergencies and other important community news by signing up for Hood River's Citizen Alert System, HERE. Interested in starting a business in Hood River County? Check out the Business Siting Guides on MCEDD's website. Hood River is considered by many to be one of the most beautiful cities in Oregon, boasting an exceptional quality of life. Please visit the Hood River County Chamber of Commerce to learn about accommodations, dining, local events and more.